A well-to-do business family, whose members are torn apart by a turbulent father-son relationship shrouded in mistrust, suspicion, and contempt for one another a result of the vagaries of the son's mind and its maladies suffers silently. Well-wishers fear that Badri is suffering from a mental derangement, and is on the brink of wiping away his father, Siveswara's hard-earned fame and fortune. Unaware of the boundless periphery of its affliction, descendants of the five-generation lineage are confounded with an enigmatic and stigmatizing battle of their lifetime which they have to decode and overcome in order to ensure the well-being of the ensuing generations. Withering Banyan is a good take on a rarely spoken about issue. 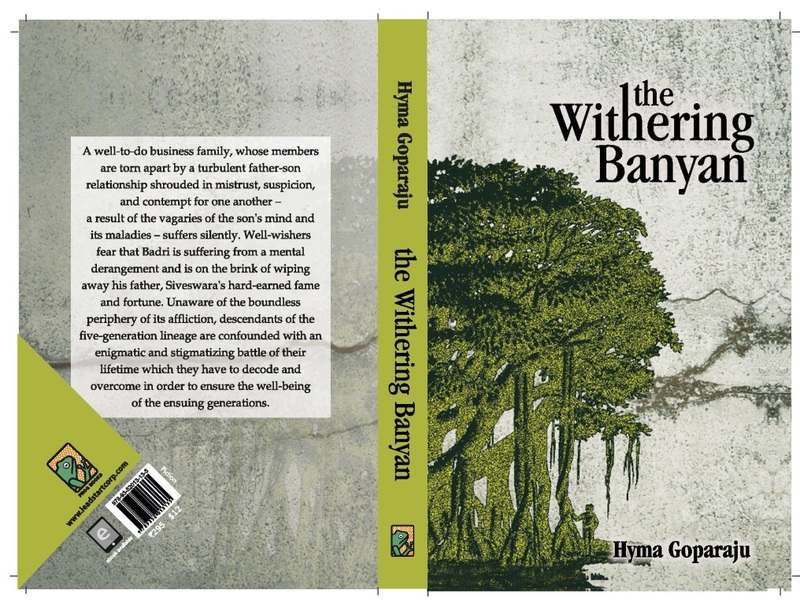 The Withering Banyan – impressive title, intriguing cover. What is the first thing that comes to your mind when you think of a banyan? It is stately, sturdy, spreading its branches far and wide, staying on its roots for decades, sometimes centuries… Now picture a withering banyan. Going gnarly at the trunk, with brownish leaves and defining the phrase ‘going to seed’. The cover is that of a banyan tree, and it looks simple, elegant and makes me want to pick up the book and peruse the writing. The summary is succinct, with enough intrigue factor and background information to actually interest the reader. Schizophrenia is a mental disorder often characterized by abnormal social behavior and failure to recognize what is real. Common symptoms include false beliefs, unclear or confused thinking, auditory hallucinations, reduced social engagement and emotional expression, and lack of motivation. Diagnosis is based on observed behavior and the person's reported experiences. What is the suggested / expected treatment? The disease is often ignored and mostly misunderstood, the patients are feared and sometimes ostracised from the society. The family of the affected patients, though sympathetic to their condition, believe that the cure often lies in religious prayers and offerings. It is still a taboo in many parts of the country to seek psychiatric help. Though things are looking up, and the number of people boldly going to seek help is increasing, it is still considered an insult to the family honour in most places. Before I took up the book, the summary and the whole withering banyan analogy captured my attention. The first chapter about a woman (Natya’s mother) breaking a mirror to kill the evil woman who was tormenting her. Nothing says the severity of Schizophrenia like this scene. From then on, the book follows Natya’s arrival in India, to her maternal house. The Marri family, once successful businessmen now going to seed because of a genetic illness, is plagued by doubt, suspicion and gossips about mental derangement fuelled by a strained father son relationship. The solution to Natya’s (and everyone else’s) problem lies in finding out where the once successful family went wrong and what is the root cause of all this trouble. The main story deals with the fact that most people in our country do not treat mental illnesses the same way they treat physical illnesses. While something like depression is a clinically recognised mental illness in the western countries, here it is brushed off as ‘feeling down in the dumps – will be okay after getting married / scenery change / difference in food / immersing in work / being bogged down by family responsibilities…’ and so on and so forth. 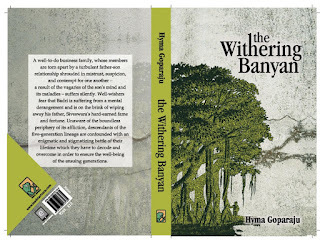 Written in chapters alternating in past and present, the withering banyan is a slow eye opener for a very prevalent but sadly rarely spoken about disease in a sensitive manner. The language is, thankfully, devoid of many errors and the author’s prowess comes through, being the saving grace of the book with such a sensitive subject. I really loved the poems too. The few complaints I had were as follows. The book seems way too long and time consuming for just 350 odd pages. Some parts are description heavy and some incidents and explanations are repetitive. This might derail the story from the main focal point. As is the way of someone strong in words, the thoughts wander and start visualising instead of grasping what the story is about. A little more medically termed explanation of Schizophrenia and its various symptoms would have made this book complete for those who do not know what the disease is all about. Overall, a great book to read and treasure. Don’t be bogged down by the description heavy scenes. · The concept of discussing a mental illness – it is much needed. · The storyline and the amazingly smooth transition between past and the present. · Not being shy to talk about a taboo topic and instead weaving it so beautifully into the story. · Not portraying people affected by the disease as ill people and instead showing readers how actually brilliant they might be. · Though it seems unavoidable, the length could have been reduced slightly to ensure casual readers do not lose interest. · No other major complaints other than the occasionally slow pace of the book. · A must read book. It speaks about how hard a family can be affected by a genetic disease and why it is essential to adapt to and make use of modern medicine / therapy. · It is rare for such books to be written in this day of quick selling romances and ‘he saw her, she saw him, they fought, they realised and got together’ type of books with subpar language. Hyma Goparaju is a management professional based in Hyderabad. She dabbled quite a lot in creative writing while at school and college, which remained dormant for a long time to come until she took the plunge to pen her first novel, The Withering Banyan . She hopes to write more.